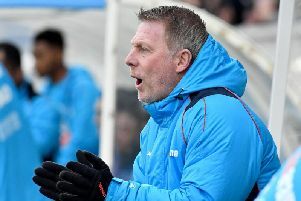 Craig Hignett is still 'working hard' on bringing in new players - but doesn't expect any free agents to join him at Hartlepool United. The Pools boss has scope to strengthen his squad should he feel free, but Hignett has so far been frustrated in his quest to add some depth. With the season entering its business end, clubs are reluctant to lose players fearing an injury or suspension crisis - and this desire to retain players has had a knock-on effect for Hartlepool. That hasn't deterred the club's manager though, with the Pools chief continuing to monitor the situation as the season progresses. "We're still working hard," said Hignett. "The stage of the season we're at, we're lucky in that we haven't got a window, but the players we're after are all at teams who are involved in one way or another. "So the clubs are going to be reluctant to let them go. "But we'll keep working hard and chipping away." With clubs unwilling to part with players, the free agent market could be an option for United. Hignett, however, doesn't believe it is a viable one - suggesting that the players currently available would not add the strength he desires to his squad. And he is keen to steer clear of short-term deals between now and the end of the season, instead preferring to look at players who would improve Pools in the long-term. "There's hardly any free agents now," the 49-year-old admitted. "The ones who are free agents are the ones that you probably don't want. The ones we're after are the ones that are going to improve our squad. "There hasn't been any that I would think would improve our squad that are out of contract. "There's one or two that we could have brought in on loan for a month or two here and there - but that's no good for your team morale or team spirit. "If you bring someone in for a month and then he goes back to his club, what's that achieved? "So unless it's a player that has got a chance of having a future at this club, I'd probably steer away from them."